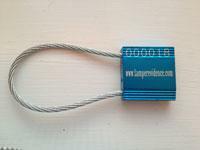 Cable Lock is high security,pull tight, cable security seal which is ISO 17712 and CTPAT compliant. Ideal for use with a wide variety of applications, including tankers, trucks, railcars, air cargo containers, calibrators and valves. 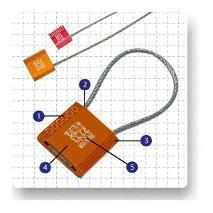 1. laser marking of sequential numbers. 2. Twisted, galvanized steel cable. 3. One way locking mechanism. 4. Durable metal locking body. 5. Custom laser marking available. 1. Laser marking cannot be removed and replaced. 2. High strength steel cable, splays when cut. Custom laser marking and custom cable lengths, now available within 7-10 working days. 3.5mm = 1200Kg - 5mm = 1400Kg.